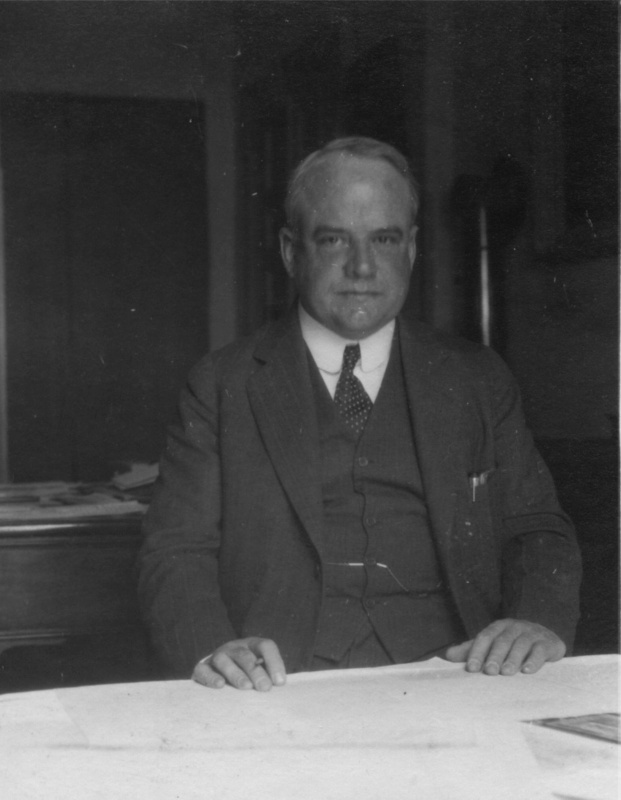 David M. Robinson, 1931. Henry Bacon who took the photograph scribbled on the back “Mussolini”. ASCSA Archives, Francis Henry Bacon Papers. Instead, and despite his initial disappointment, Robinson, in the course of four campaigns (1928, 1931, 1934, and 1938), would uncover a multitude of well-preserved ancient houses with impressive pebble mosaics, thus shedding new light on the domestic life of a Classical Greek city. By his not having found a considerable amount of material post-dating the destruction of 348 B.C., Olynthus was also thought to be established as one of the few chronological fixed points in Greek archaeology (although this notion has been challenged since then, it still is in part valid). (For a thorough reconsideration of the Olynthus excavations, see Nicholas Cahill, Household and City Organization at Olynthus, New Haven 2002). Olynthus Excavations, in front of the dig house, 1931. Mary Ross Ellingson (sixth from left). ASCSA Archives, Saul and Gladys Weinberg Papers. 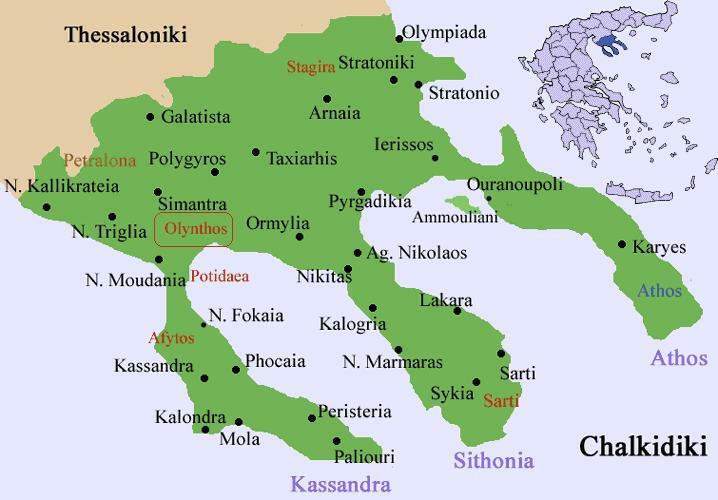 The site of Olynthus in Chalkidiki. Click to enlarge. Rhys Carpenter, director of the School (1927-1932), outlined the requirements as follows: a) a project should have a “qualified staff including members of the School, and proper technical equipment”; b) the excavation should “be carried to a legitimate conclusion within a reasonable time, without leaving the site in a half-excavated condition”; c) the results should “be adequately published within three years of the termination of the excavation”; and, last but not least, d) “the full cost of the expedition (excavation, preservation of the site, publication) would be borne by you” Carpenter wrote to Robinson. With ancient Corinth lying like an open sore after thirty years of continuous digging and no site preservation, the School was eager to put an end to such practices. Yet, the three-year publication limit would elicit a smile today. Neither Carpenter nor Capps, despite their other abilities, had any experience in digging or publishing the results from a multi-season excavation. And, oddly enough, while Robinson in general tried to skirt the “Olynthus conditions,” the one he respected and honored most was that concerning the publication. 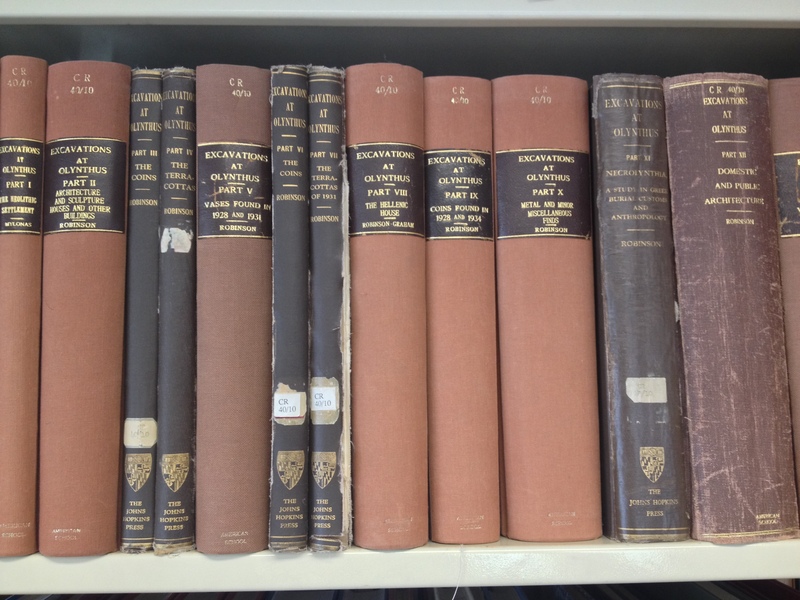 With all its problems, the Olynthus excavation was fully published in fourteen volumes, a remarkable achievement for its time, especially since most of the volumes were single-authored by Robinson himself. 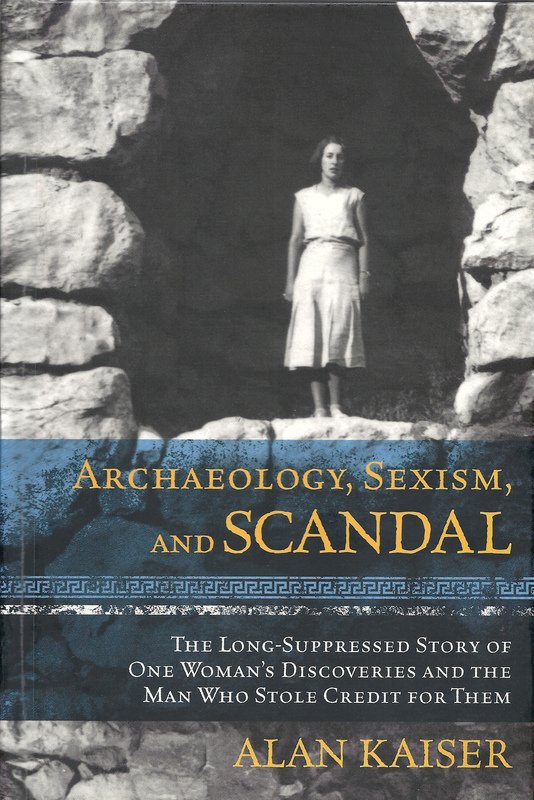 A new book with a long but catchy title, Archaeology, Sexism, and Scandal: The Long-Suppressed Story of One Woman’s Discoveries and the Man Who Stole Credit for Them (London: Rowman & Littlefield, 2015), however, makes a serious dent in Robinson’s carefully constructed personal myth. Olynthus does not appear in the book’s title but that’s where it all started in 1931, in Robinson’s second excavation season. The female figure in this drama is Mary Ross Ellingson (1906-1993), a graduate student in archaeology at Johns Hopkins University. The “man who stole credit” (and published Ellingson’s M.A. thesis under his name) was her professor and mentor, David Robinson. Alan Kaiser, the author of the book and a professor of archaeology at the University of Evansville, brought to light and placed in its context not just a story of plagiarism but one of open and accepted sexism in the male-dominated circles of pre-and-post WW II American academia. By publishing the previously untold story of Ellingson, Kaiser has contributed to a recent effort by a number of classical archaeologists “to have a frank discussion of classical archaeology’s history rather than contribute to the creation of a mythological past” (Kaiser 2015, 189). The number of articles and books Robinson wrote is staggering, it even appears heroic; to know that he had unacknowledged aid with his publications helps to bring him down to a human level. Keeping knowledge like this suppressed leaves him a myth, not a man (Kaiser 2015, 190). The frontispiece from Excavations at Olynthus VII. 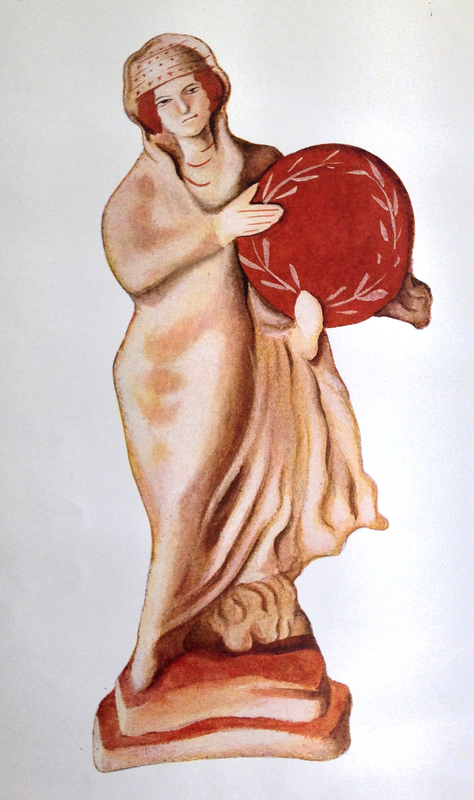 One of the figurines that Mary Ross Ellingson found in Olynthus in 1931. In addition to serving the cause of justice, Kaiser also has written a captivating book that shows us how to write archaeological biographies that are not boring. This is not just a book about ethics in archaeology in the 1930s; it is also about academia and intellectual barriers in the 2010s that still consider “biography” to be scholarship “light”, contributing little to the academic credentials of a scholar being considered for tenure or promotion. No wonder that the few archaeological biographies that have been published come from the pens of scholars who either have achieved full professorial status or are in alternative careers. While unraveling and contextualizing Mary Ellingson’s story, Kaiser also shares with the reader his own personal odyssey, inasmuch as his text, initially conceived as an article, was rejected by “eleven editors and more than two dozen peer reviewers.” One reviewer actually wrote: “what you are dealing here is part of the unwritten history of classical archaeology. Best to leave it unwritten” (Kaiser 2015, 186). The untold story of Mary Ross Ellingson was, in fact, nearly suppressed a second time when Kaiser buried his text and her papers in a shelf after not being able to find a publisher. “The years passed and I moved onto projects other than Ellingson’s until a little over a year ago when I received an email from Ellingson’s oldest daughter… After hanging up, I got the photo album back down from the shelf for the first time in years… An idea began to form in my mind; perhaps my mistake had been trying to contain such a large and complicating story within the confines of a brief article, maybe Ellingson’s story would make a better book” (187-188). 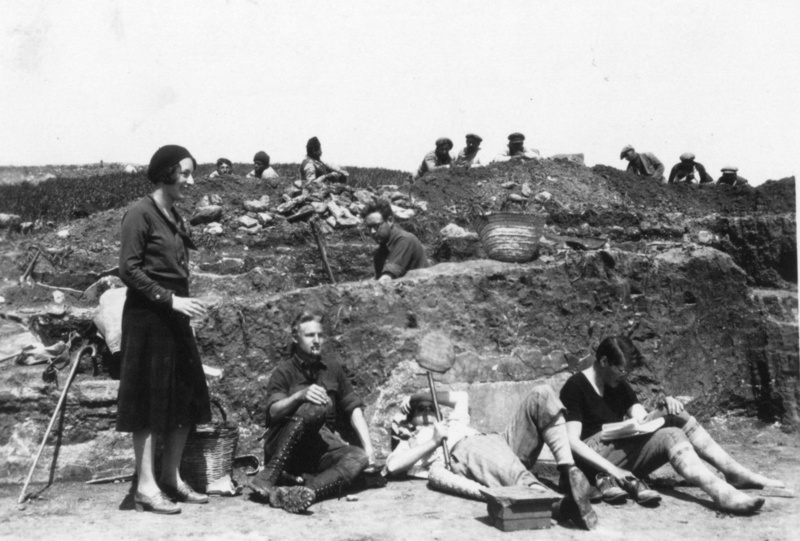 Olynthus Excavations, 1931. Mary Ross (Ellingson), Alexander Schulz, Walter Graham (at the back), George Mylonas (lying down), and Gladys Davidson (Weinberg) reading The Nation. ASCSA Archives, Saul and Gladys Weinberg Papers. Kaiser, to his credit, has given us a compelling and eminently readable book. It is also the sort of book that you keep thinking about long after you have finished it. One particular question kept circling in my head. Why did she not hold a grudge against Robinson after he stole her work? Why did she return to Johns Hopkins a few years later to write her Ph.D. under Robinson’s supervision? And when Robinson committed the same “crime” again by publishing a chapter from her dissertation in Olynthus XIV without adding her name to the contributors of the volume, why did she continue to correspond with him amiably as if nothing had happened? As I was mulling over various possible explanations, I realized that I was missing much of Mary Ellingson’s personal identity. I had had glimpses of her character through her letters from Olynthus but she became elusive afterwards. Kaiser has done an excellent job as a biographer in placing his subject in her milieu but he did not crawl inside her skin, although he admits that Robinson and Ellingson shared a complicated relationship. He lost her somewhere after Olynthus. Was this a case of low self-esteem? Or had Robinson edited the early drafts (which have not survived) of her M.A. thesis so much that by the time he incorporated her text in his book (Olynthus VII) neither of them felt that a “crime” had been committed? Yet, forty years later (and after Robinson’s death) Ellingson would reclaim her work in an obscure note that Kaiser discovered in her personnel file. Under “publications” she had listed Olynthus VII and next to it she had added “the work is acknowledged as mine in introduction” (Kaiser 2015, 137). Any dig at the start, even the most organized one, is forced to deal with unexpected problems, and it takes some time for the participants to find their rhythm at work and a balance in personal relationships. It did not take long for Wilhelmina, Eunice and Herbert to realize that the last place they wanted to be was Olynthus. Wilhelmina wrote long, unhappy letters to her mother, which are preserved in the Special Collections Division of Newman Library at Virginia Tech. Her husband, architect Herschel Elarth, donated her papers to the University after Van Ingen’s death in 1969. Then it fell upon a retired professor to tell Wilhelmina’s story. Raymond Dessy, professor emeritus of chemistry, was sitting in a history class at Virginia Tech taught by professor Glenn Bugh, and the mention of Van Ingen’s archive triggered his curiosity. After reading her papers Dessy took it upon himself to tell her story like a stage play, in a work titled “Exile from Olynthus” (http://scholar.lib.vt.edu/faculty_archives/dessy/exile.pdf; from which quotes above and below). Less than two months after their arrival at Olynthus, Van Ingen, Stebbins and Couch left the excavation in bad terms. “They have been from the very start very insulting to Mrs. Robinson and others…” Robinson claimed in a letter to the director of the American School, Rhys Carpenter, on May 5th, 1928. “He accused us of being aloof, of having refused to let Alice Robinson (daughter) share our room, of having insulted Mrs. Robinson, and of a lot more things that were absolutely untrue,” Wilhelmina had written to her mother several days earlier. The fact that Stebbins and Couch had decided to get married in Thessaloniki during the excavation season also increased the frequency of the meltdowns. “It is too bad to have this love affair just when we have more work than we can do. Why could they not have waited till the School year was closed?” Robinson complained to Carpenter. Comparing the two stories, I could not help thinking how much happier Mary Ellingson had been in Olynthus in 1931 and how different from Wilhelmina’s was her relationship with Davy (as his students called him) Robinson: almost flirtatious. He called her “Miss Olynthus,” and she enjoyed his compliments (Kaiser 2015, 28). Not to mention that all the people got along beautifully during the second season, unlike 1928. 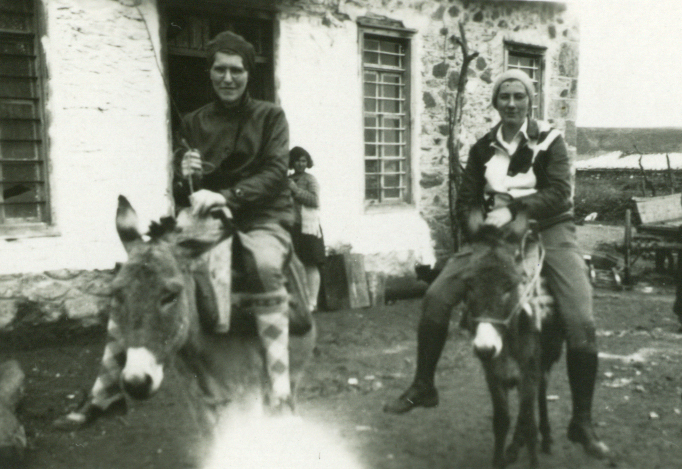 Gladys Davidson (Weinberg) and Sally Freeman, two of Mary Ross’s excavation mates in 1931. ASCSA Archives, Saul and Gladys Weinberg Papers. In addition to hating her time in Olynthus, Wilhelmina did not hesitate to pass judgment on Robinson’s ability as an excavator, influenced by, and resonating with, the concerns of other people. “I am beginning to see that being a product of David M. Robinson may be a decided disadvantage -he is thoroughly disliked and discredited by many good scholars and his books, and those produced by some of his students under his direction, have been reviewed most unfavorably… he is a poor scholar, ungentlemanly, and not always honest. The unscientific way in which these excavations are being conducted is a scandal. That is already being aired in Athens …” wrote Wilhelmina to her mother. Despite Robinson’s pleas to sever Van Ingen from her Carnegie Corporation fellowship, accompanied by threats, Carpenter released all three from Olynthus, just before Eunice’s and Herbert’s wedding in Thessaloniki. 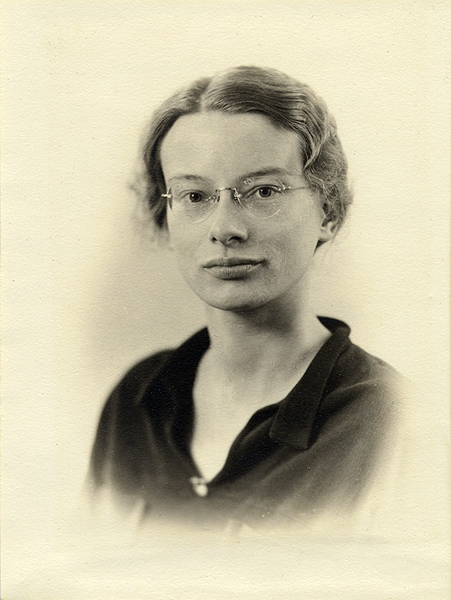 Wilhelmina also found additional support from Ida Thallon Hill and Elizabeth Pierce Blegen, who were sympathetic to their Vassar protégé and supported her decision to transfer from Johns Hopkins to Radcliffe College. Whether it is right or wrong to identify Robinson as “Mr. Blank,” Robinson did not enjoy the best reputation in the circles of the American School. He was considered roguish, and neither Capps nor Carpenter trusted him. Already by June of 1928, Robinson had casually forgotten he had agreed in February that the School would assume no financial obligation for publishing the excavations at Olynthus, and he was pestering Capps to underwrite the publication cost. “A queer bird, Robinson!” wrote an exasperated Capps. Carpenter too did not harbor any sympathetic feelings for Robinson. Despite their cordial correspondence, in the Olynthus’ folder there is a letter that Carpenter sent to Mortimer Graves of the American Council of Learned Societies concerning a grant application Robinson had made to the Council for continuation of the excavations in 1931. In my judgemnt [sic] Professor Robinson is an extremely bad excavator. The worst piece of excavating of our School in Old Corinth dug in 1903 or so and since then causeing [sic] me a lot of trouble a lot trouble, was dug by D.M.R. while a student at the School. When I visited him in Olynthos in 1928 I did not feel that his methods had improved very much. He has learned nothing about stratification and does not understand excavational evidence but belongs to the old Schliemann School that dug for ‘finds’ (ASCSA AdmRec, 204/24, folder 3, February 27, 1931). 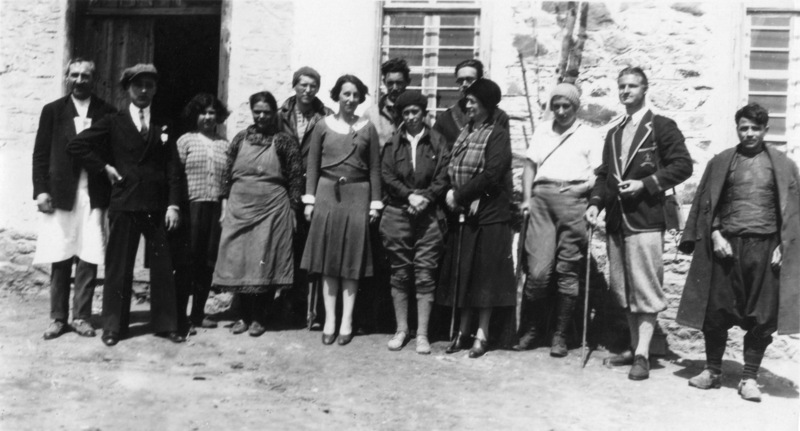 Although the ASCSA tried to remedy the problem by sending archaeologist George Mylonas (then also a bursar at the School) to “inspect” the state of affairs at Olynthus in 1931, the person who really “saved” the excavation was a young Canadian graduate of Johns Hopkins, J. Walter Graham (1906-1991). The latter changed Robinson’s recording techniques and “vastly improved the quality of the information the team was recovering” (Kaiser 2015, 48). 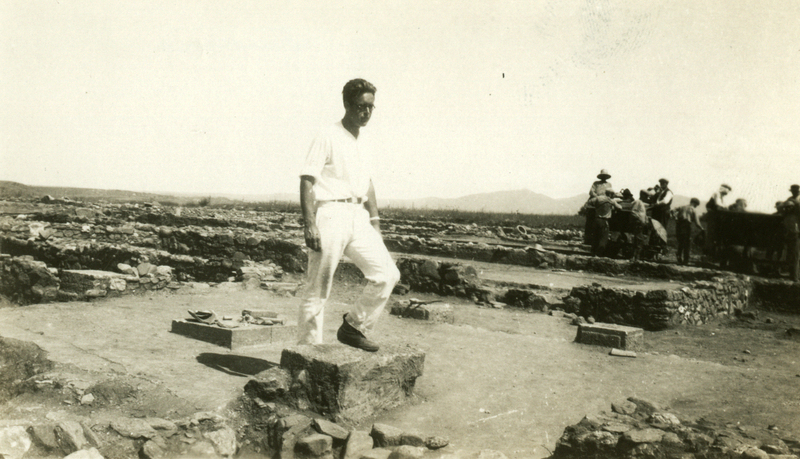 Walter Graham at Olynthus, 1931. ASCSA Archives, Saul and Gladys Weinberg Papers. Although this is the first time that anything concerning Olynthus and the buying of antiquities has appeared in print, I must remind you of the various rumors of which I was warned last winter in connection with the previous campaigns on that site. Furthermore, I must beg you to take every precaution against the smuggling of antiquities by the workmen, even if it involves reducing the area over which you are excavating so as to insure adequate supervision… Watching workmen is not as simple as it sounds (ASCSA AdmRec, 204/24, folder 3, April 18, 1934). To Robinson’s defense came Ephor N. Kotzias, who also felt threatened by the accusations of poor vigilance at Olynthus: «Εις ουδεμίαν των μέχρι τούδε εν Ελλάδι ενεργηθεισών ανασκαφών η εποπτεία υπήρξε τόσον ενδελεχής και άγρυπνος, όσον η των εφετεινών εν Ολύνθω» (At no excavation anywhere in Greece has supervision ever been so effective and vigilant as in Olynthus this year). Four years later, in 1938, it fell to another director of the American School, Charles H. Morgan (1936-1938), to caution the Executive Committee about Robinson’s inadequate methods of excavation and supervision, suggesting that they “take action definitely to make it impossible for D.M.R. ever again to work under the School’s auspices. How a man who has had so many responsible posts can allow himself to try to shirk the onus of his own mistakes by blaming them on his subordinates I don’t know…” (ASCSA AdmRec, 204/24, folder 3, Morgan to Capps, June 23, 1938). Never one to admit an error, Robinson had passed the buck for any and all wrongdoings in the past to Graham. Even Mylonas, the assistant director of the excavations in 1938, “had to make some concessions to his theories to keep a leaky ship from going down altogether” added Morgan. 1938 would indeed be Robinson’s last season at Olynthus, whether he knew it or not. WWII, Greek Civil War, a law that prohibited new excavations in Greece before 1950, his advanced age, and his poor reputation made Robinson’s return to Olynthus unattainable. Robinson was a “Teflon man,” however. Even after he was dismissed from Johns Hopkins in 1946 because of accusations that he had kept for himself antiquities that belonged to the University, one of the largest Festschrifts (2,212 pages) ever was presented to Robinson in 1951 for his 70th birthday. More than 250 esteemed scholars from all over the world responded to George Mylonas’s call for contributions. 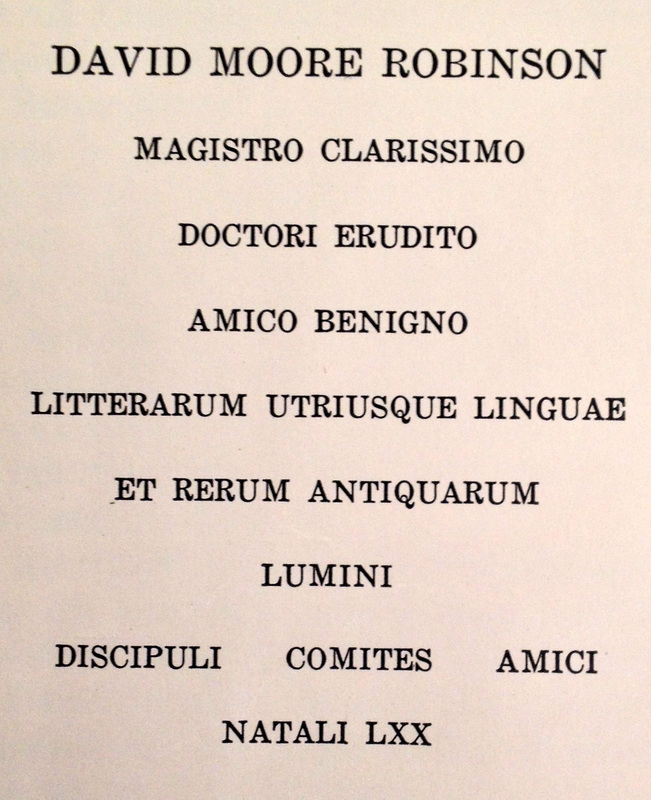 With the exception of Hazel Hansen and William McDonald, almost no one who had worked at Olynthus (and none of the ASCSA directors during whose terms Robinson had excavated the site) contributed to Robinson’s Festschrift; only Mylonas had remained loyal, most likely because he was the only one whom Robinson had treated as (almost) equal from the start. Fascinating stuff, Natalia, many thanks for sharing the story. As one who has read all of the papers of Wilhelmina van Ingen in our collection (there is also a small sherd sampling), it brings a very personal touch to the story. And I might add that there is a mysterious week missing from her diary in April 1928 where everything imploded at Olynthos. I suppose it is no surprise that Wilhemina, who went on to teach art history and work with Mylonas, never listed the first season at Olynthos on her CV. I am sorry that I never had a chance to meet her here Blacksburg (she had died many years before), but my senior colleagues in the department told me that she was a charming and social person in the community, but never talked about those dark days. I did ask Virginia Grace about the whole incident years ago, and she remembered a very young and naive Wilhelmina (who gloried in meeting Wilhelm Dorpfeld in Athens) and the fact that Virginina had given her comfort after her ‘escape’ from ‘Davey’ at Olynthos. I often think of Procopius when I think of the ASCSA: the official history and the secret history. Thank you for this, and all the others Natalia, they make very interesting reading. I hope this finds you and the team well. Beth is in Ethiopia and Laura in college, so it’s just me and the cat in Virginia; If I’m going to be alone, better I think to be in Athens. Best, J.